The heart of Christianity is not a ritual or a structure, but a person: Jesus Christ. But even as his followers, our vision of Jesus can get muddied by man-made theories of who he was. Whether you're a seasoned believer or a brand-new Christian, come walk in the footsteps of his first disciples to see him afresh: as Teacher, Healer, Shepherd, Servant, Savior and Risen Lord. These six sessions lay the foundation for radical discipleship as our hearts are once again captured by who he is. Brett Eastman has championed small groups and leadership development at both Saddleback and Willow Creek Community Church over the past decade. He is president and founder of LifeTogether, and one of the authors of the Silver Medallion winner Doing LifeTogether, the adult curriculum published by Zondervan. Dee Eastman is the co-director of the womens Bible study at Saddleback Church called "The Journey." Todd is the lead pastor of the River Church in the South Bay, California. Denise Wendorff co-leads a women's Bible class at Saddleback Valley Community Church called The Journey. 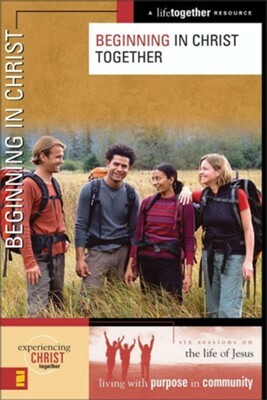 I'm the author/artist and I want to review Beginning in Christ Together - eBook.